Millions of people around the world die each year from smoking-related diseases. Smoking used to be advertised to be good for one’s health until studies show that smoking tobacco actually contains different types of carcinogenic chemicals. Even with different methods to warn people of the harmful effects of cigarettes, millions of people still continue to smoke because they’re already addicted to nicotine. Nicotine is a highly addictive chemical but it’s not categorized as a carcinogen. What makes tobacco smoking harmful are the other chemicals and not exactly because of nicotine. One method to put nicotine in your system without introducing these harmful chemicals in your body is through the use of the nicotine patch. Many have tried it but not all find it to be the solution to help them finally get rid of the addiction. They still want to enjoy smoking and savor the taste of the smoke in their throat and puffing the smoke after. With nicotine patch you won’t have that luxury so people still crave to smoke a few sticks of cigarette just to satisfy that craving because it became a habit for them. One other method to get the nicotine without the harmful carcinogenic chemicals is with e-cigarettes. E-Cigarettes were invented in 2003 by Ruyan, a company established in China, and it was introduced to the United States in 2007 then to the rest of the world. E-cigarettes or electronic cigarettes give you the same feel of a real cigarette but minus the harmful chemicals and smoke. It also comes in different flavors and can be disposable or reusable depending on the type of e-cigarette you choose. When you inhale in the vapor, the LED will light up so it looks like the ember tip of a cigarette. You will then be exhaling vapor and not smoke which dissipates quickly and does not have any smell. Second hand smoke will be eliminated so people around you won’t have to suffer from smoking related diseases caused by your smoking addiction. E-cigarettes are actually not being sold as a smoking cessation device. Rather, it’s an alternative to smoking which is claimed to be healthier. There are still studies being conducted as electronic cigarettes can’t be regulated under Tobacco regulation because it’s not categorized as such. But, because it only contains nicotine and low voltage electricity is required to turn the e-liquids to vapor, it is an obvious safer alternative. Even though it is not promoted or sold as a smoking cessation device but it can actually help you to finally stop smoking. Slowly reduce the nicotine strength until you no longer crave for nicotine. Choose an e-cigarette to buy. You can start your search by reading through e-cigarette reviews online and find a reputable company with quality electronic cigarettes. Price is a factor but quality is what’s important. Check what their brand of e-cigarettes offer and make the comparison. After making the choice of e-cigarette company and the brand you want, now it’s time to choose the shape and size of e-cigarettes that fits your preference. Choose the flavors to make your experience even more exciting. You may also choose the accessories you want and take note of the battery life. Enjoy smoking your new electronic cigarette. Throw away your regular tobacco and start using the electronic cigarettes. It may take some getting used to but you’ll notice that it actually gives you the same feel as smoking regular tobacco. Start with the nicotine strength that you are most comfortable with and slowly reduce its strength. Don’t abruptly reduce the nicotine strength as your body would still be unable to adapt to the lower level of nicotine so you’d end up using it more often. If you are successful and you reached the nicotine strength of zero, you can finally say to yourself that you already got rid of the habit of smoking. You can quit using the e-cigarette or continue using it for leisure. They offer different flavors with zero nicotine so you can continue to enjoy the experience of smoking. Many who have tried using electronic cigarettes to help them stop smoking actually recommends it to their friends or loved ones who are also having difficulty kicking the addiction. 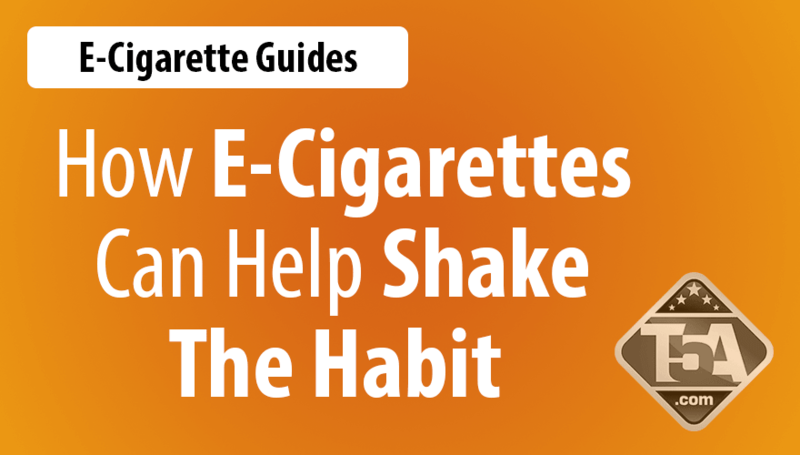 Many claimed that they are able to kick the habit in just 6 months or even less. More so, it really doesn’t matter how long it’s going to take you to finally kick the habit of smoking and nicotine dependence. What matters is that you are slowly reaching your target and with every time you reach for your electronic cigarette you are only inhaling the great flavor and the nicotine without all the horrible carcinogens that goes with regular cigarettes.